In the Vajrayana Buddhism of Tibet the Nyingma tradition (rnying ma or gsang sngags rnying ma) is the oldest Buddhist school and the Nyingmas are the followers of the Ancient Tantric Tradition. The Nyingmas trace their roots of tradition to the Indian Mahasiddha Padmasambhava (Guru Rinpoche) of Oddiyana. As a Vajrayana master he thaught the highest classes of tantra, the written vehicles of the Vajrayana. These unbroken transmission became known „Treasures“ (gter ma) and were concealed in different ways. High masters who are able to reveal these treasures are known as tertons (gter ston) . The transmission from Padmasambhava through the tertons is called the Terma. The Terma scripts written by different calligraphers, human or non-human dakinis and those written by Guru Rinpoche himself. Scripts written by Nyingma lamas, in form of deva nagari character (mkha' gro' brda' yig), using their mystical writings, in a symbolic script (kin code script). Different calligraphers with different calligraphic styles and designs. It is not unusual to find different representations for the same character. 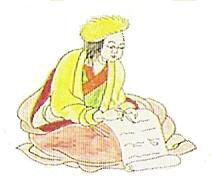 The Nyingmas describe the Guru Rinpoche’s handwriting as thin and ravishingly beautiful, others are thick and smooth, or big and effectual in composition. There exist a lot of Terma scipts, common or uncommon, known as daka or dakini scripts. But you don't see the originals, they are all copies of old transcriptions. The charts of fonts displayed as a gallery on the next pages explain a total of 54 different scripts drawn on 20 old „pecha“ woodblock prints. Some pechas are written in alphabets directly corresponding to the Tibetan alphabet. Some charts are attached by consonants adding vowels, other charts are without. In few charts are some ligatures or conjuncts. By reason of the bad condition of the pechas some of the signs are unreadable and impossible to decipher.